NDR spam: Why am I receiving an NDR for a message I didn?t send? 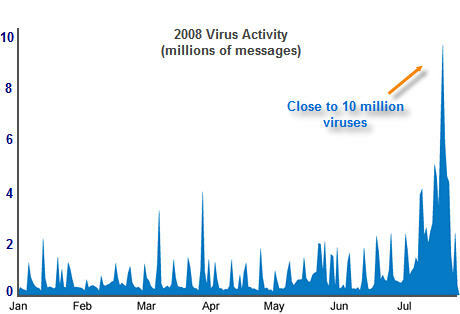 NDRs are a normal part of email exchanges, but spammers’ activities can cause spikes in NDR activity. Spammers send junk messages to thousands of email addresses, some of which exist and some of which do not. To give the appearance that their messages are legitimate, spammers use a practice called “spoofing,” whereby they manipulate the “From” address to use a real domain or sender. When a spammer sends email to an invalid address, the receiving mail server sends an NDR message to the “From” address, rather than to the actual sending server. Because spammers spoof common addresses, such as sales or info of well-known companies, these NDRs may be destined for your mail server. Another challenge is that the growth in NDRs is driven by the overall growth in spam activity. The more messages spammers send, the greater the number of spam messages sent to invalid addresses, resulting in more NDRs. We highly recommend that anyone running a corporate email server invest in top-of-the-line Anti-spam technology. It will pay off a thousand fold in the long run. Most good anti-spam solutions do a reasonable job of limiting the impacts of NDR spam attcks. But almost all still will allow a sender to try quite a few bad recipients before shutting them down.